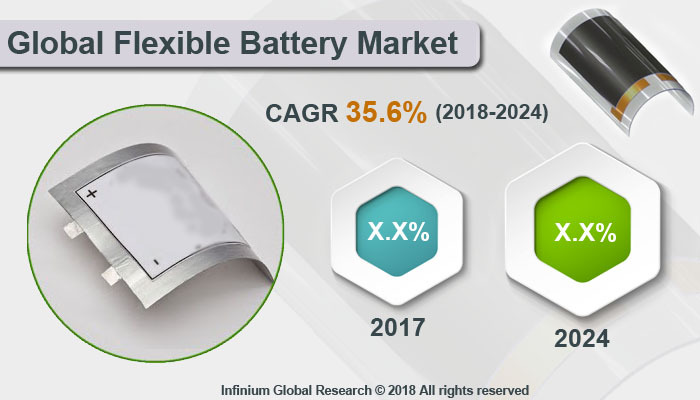 A recent report published by Infinium Global Research on flexible battery market provides in-depth analysis of segments and sub-segments in the global as well as regional flexible battery market. The study also highlights the impact of drivers, restraints, and macro indicators on the global and regional flexible battery market over the short term as well as long term. The report is a comprehensive presentation of trends, forecast and dollar values of global flexible battery market. According to the report, the global flexible battery market is projected to grow at a CAGR of 35.6% over the forecast period of 2018-2024. Flexible batteries are the micro-batteries that are designed to be conformal and flexible. These batteries are highly flexible, portable, and lightweight compared to the other traditional batteries. They also have high power, high energy density, and remarkable rate capability. The advantages of flexible batteries are their conformability, lightweight, and portability, which makes them easy to be implemented in products such as flexible and wearable electronics. Rapidly growing demand for wearable electronics is the key factor that drives the growth of flexible batteries. The flexible batteries are used in a wide range of wearable application including smart watches and flexible displays such as phones, tablets, and TV. The wearables require internal components that have high flexibility as they have to withstand bending and twisting. The rapid developments in the wearable electronics sector are creating massive demand for flexible power supplies. In addition, the rising demand for the miniaturization of electronic devices is expected to contribute to the growth of the flexible battery market. Several IoT devices need batteries with high power storage capacity, rechargeability, and wireless connectivity. The flexible batteries are the best suitable option for the IoT devices. The rising uses of IoT in healthcare and the many other industries are anticipated to escalate the growth of flexible battery devices. However, the high cost and lower capacity of the flexible battery hampers the growth of flexible battery market. In addition, the advancements in the flexible battery technology and its introduction in the electronics textile for the printing contribute to the growth of this market. Among the geographies, the Asia Pacific region is the largest and the fastest growing region in the flexible battery market. The growing acceptance of wearable devices in the Asia Pacific region is the key factor that drives the growth of flexible battery market in this region. The high consumption of consumer electronics is another major factor the growth of flexible batteries in this region. The ongoing developments in the flexible batteries such as the use of flexible batteries for the electronics, textile applications are anticipated to boost the growth of flexible battery market in the Asia Pacific region. North America holds the second largest market share in the flexible battery market owing to the growing use of wearable devices in the healthcare sectors and high adoption of advanced technologies in this region. The report on global flexible battery market covers segments such as material, type, chargeability, and end users. On the basis of material, the sub-markets include electrically conductive materials and ionically conductive materials. On the basis of type, the sub-markets include thin-film, printed, curved, and other( aluminum battery, paper battery). On the basis of chargeability, the sub-markets include chargeable, and single-use. On the basis of end users, the sub-markets include consumer electronics, healthcare, packaging, transport, and logistics. The report provides regional analysis covering geographies such as North America, Europe, Asia-Pacific, and Rest of the World. In this section, the key trends and market size for each geography are provided over the period of 2016-2024. The countries covered in the North America region include the U.S., Canada, and Mexico; while Asia-Pacific includes China, Japan, India, South Korea, Malaysia, and among others. Moreover, Germany, U.K., France, Spain, and Rest of Europe are included in the European region. The U.S. drives the growth in the North America region, as it is the largest market in this region. The Asia-pacific region offers a substantial potential for the market growth owing to rapid growth in markets such as India and China. The report provides profiles of the companies in the market such as Panasonic Corp, LG Chem Ltd, Brightvolt Inc, Ultralife Corp, NEC Energy Solutions Inc., ST Microelectronics N.V, Blue Spark Technology, Apple Inc, and Enfucell Oy. The report provides deep insights into the demand forecasts, market trends, and micro and macro indicators. In addition, this report provides insights into the factors that are driving and restraining the global flexible battery market. Moreover, The IGR-Growth Matrix analysis given in the report brings an insight into the investment areas that existing or new market players can consider. The report provides insights into the market using analytical tools such as Porter's five forces analysis and DRO analysis of flexible battery market. Moreover, the study highlights current market trends and provides forecast from 2018-2024. We also have highlighted future trends in the flexible battery market that will affect the demand during the forecast period. Moreover, the competitive analysis given in each regional market brings an insight into the market share of the leading players. This report will help manufacturers, suppliers, and distributors of the flexible battery market to understand the present and future trends in this market and formulate their strategies accordingly.